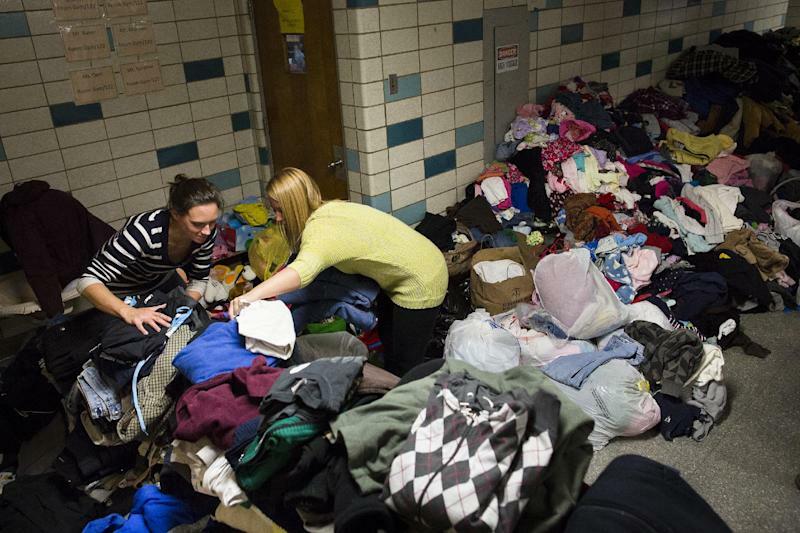 MOUNT LAUREL, N.J. (AP) — Superstorm Sandy has brought out generosity far and wide in the biggest U.S. relief effort for the American Red Cross and other groups since Hurricane Katrina swamped the Gulf Coast in 2005. And while the response is heartwarming, some of that is also helping create a "second disaster after the disaster," in the words of one expert. It's a common quandary after natural disasters displace lots of people and destroy homes and possessions. Relief groups need very specific things, along with cash and organization. Instead, they get vases and vacuum cleaners, or interference from well-intentioned volunteers who think they're helping but are just hindering efforts. "It's really been a lot of stuff really affecting the disaster site," said James McGowan, the associate director of partnerships at the National Voluntary Organizations Active in Disaster, who made the "second disaster" analogy. "They're just showing up and they're not coordinated with the agencies." Ad hoc relief groups need to make sure they are taking in only items that are requested and can be distributed. Money is the best because organizations don't have to pay to move it and can tailor spending to changing needs, McGowan said. Transporting and distributing a simple donated can of food can be $15 to $25. People who insist on giving physical goods should make sure they're working through groups that are coordinating with organizations on the ground, McGowan said. Established groups are taking aid to areas that need it. "Some of our agencies are really focused on those areas that say they're not getting any help," he said. "We are out there." The Fire Department in Mount Laurel is proud of what it organized for people just an hour away who were slammed by the storm at the end of October, sending off 11 trucks of donated supplies Friday morning. "If this happened to my family, I'd want people to help out like this," said Capt. Chris Santone, chairman of the department's relief effort. The confounding part was figuring out what to do with things not requested: the vacuums and vases, pots and pans, opened cases of bottled water, and used clothing. By the time the department's 24-hour donation drive was done, a pile of clothes 7 feet high filled up a bay usually used to park a truck at department headquarters. The pots and pans and clothing are being sent to the Salvation Army. Nonperishable food, bottled water, diapers, baby wipes and cleaning supplies are going to shelters that requested them; other supplies are going to the Toms River Fire Department to aid firefighters and their families whose homes were damaged by Sandy's storm surge. Several similar efforts have happened or are in the works elsewhere. Groups are planning to move goods from Pennsylvania to Long Island and from Delaware to New Jersey. Wayne Piaggi, a trucker from Adams, Mass., who drives between western Massachusetts and New Jersey most days, decided he wanted to help. He was going to gather all kinds of supplies until he spoke with officials at shelters and the Red Cross. "They have a lot of everything; they need food. They don't have anything to eat," he said. "We put the word out that we need food right away." He's planning to accept donations in Massachusetts until his truck is full, and take it to New Jersey. Melanie Pipkin, a spokeswoman for the American Red Cross, confirmed that "well-intentioned, yet inappropriate" donations can divert relief groups and governments. The Red Cross said that by Friday it had raised $117 million in donations and pledges, and the Salvation Army cited $5 million. NBC and ABC held campaigns that brought in a combined $40 million. Some would-be participants in the canceled New York City Marathon turned a day of running into a day of service. Lady Gaga donated $1 million, one of many celebrity-driven efforts. The Marshall Tucker Band is loading up a tour truck in South Carolina to ship goods; comedian Louis C.K. is planning a benefit show in New York City's hard-hit borough of Staten Island. A group of Philadelphia-area businesses is sending 7,500 boxed lunches to the Jersey shore for victims and volunteers. The Humane Society of America and some corporate partners are donating 40,000 pounds of food and medicine for displaced pets. Despite relief organizations' advice, some people are still taking matters into their own hands because they can't stand to see suffering. In Towson, Md., Lee Giroux isn't being picky about what will be accepted at a fundraiser, featuring most of Baltimore's food trucks, scheduled for Saturday. Anything people want to send, she said, she'll take. Among the items she's asking people to provide are grills and charcoal to cook for aid workers. Her plan is to take a caravan of trucks from place to place unloading whatever is needed. Giroux, a New Jersey native, said she has been speaking with people in the state's Berkeley Township, where her father lives. 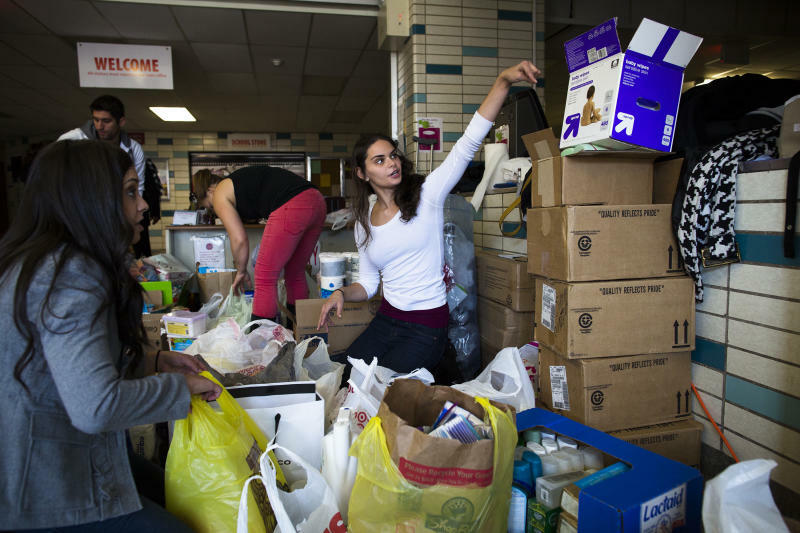 She has heard from officials and acquaintances there that many more supplies are needed, and she's not buying that the established groups have distribution under control. "The Red Cross can't keep up with the demand," she said. Associated Press reporter Brett Zongker in Washington contributed to this report.